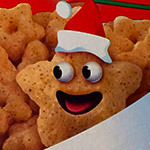 2018's Hottest Holiday Junk Food! | Dinosaur Dracula! 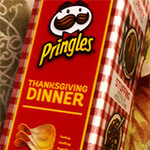 ‘Tis the season for eating garbage and blaming the time of year, so let’s do that. 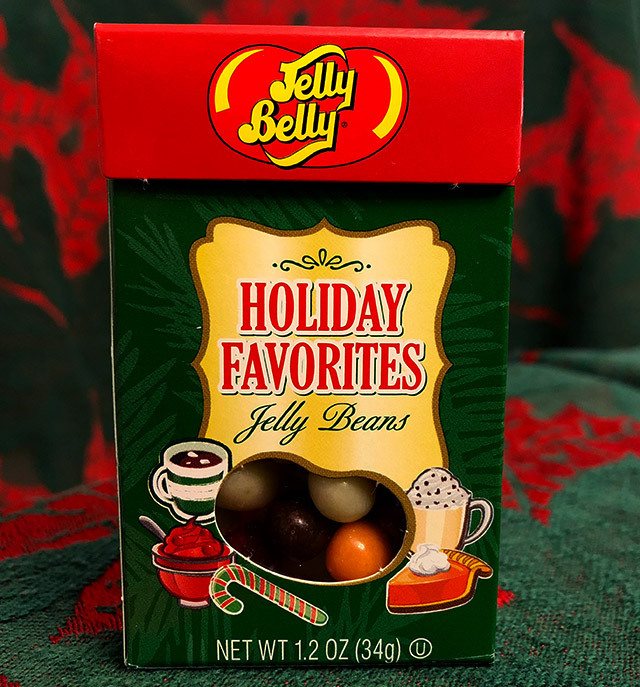 Below are five of 2018’s hottest holiday junk foods. Some are new, others are just new to me. 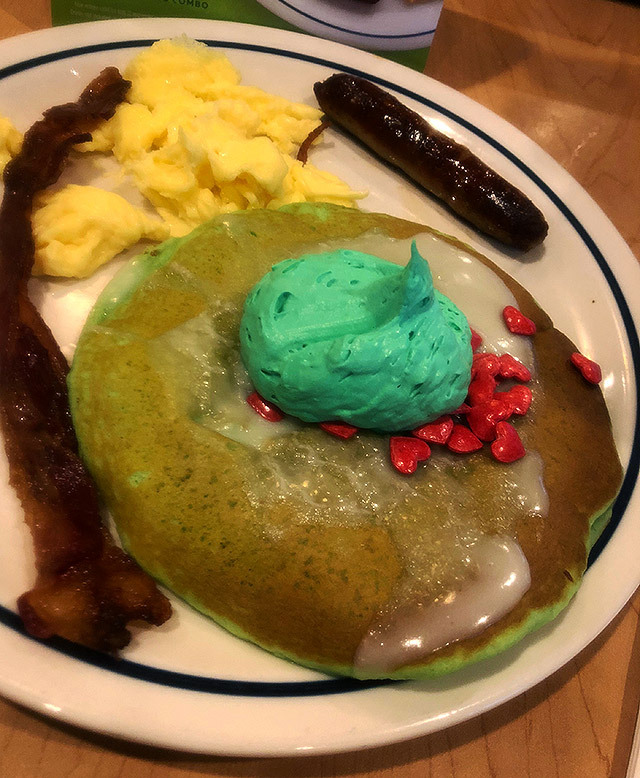 As soon as I heard about IHOP’s green pancakes, they were all I could think about. I spent weeks in a state of utter distraction, fumbling through simple tasks. Finally ordering them felt less like satisfying curiosity and more like corrective surgery. 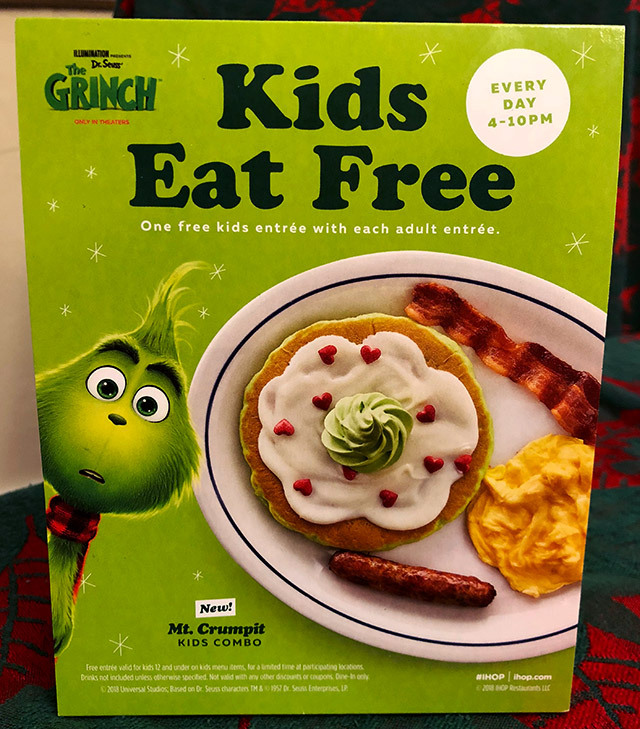 The Grinch’s Green Pancakes — an edible promo for his new movie — will only be around for a short time. For all I know, they’ll be gone by the time you read this. The dyed pancakes are topped with a sweet cream cheese icing, which itself is topped with green whipped cream. The pancakes were beautiful in the promo shots, but it was a different story on our table. It was as if the Grinch splooged and shat upon a moldy pancake. As someone who believes that the Whos of Whoville are True Neutral at best, I don’t why the Grinch hates me. In fairness, I’ve seen many photos of these pancakes floating around social media, and most of them looked just like the promo shots. This was just an unlucky break, likely due to a hurried preparation at a too-busy IHOP. GRADE: A+. Ugly as it looked, it still tasted like a birthday cupcake. 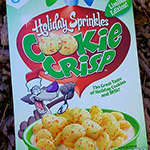 I almost passed on this cereal, believing it to be a rehash from a prior year. 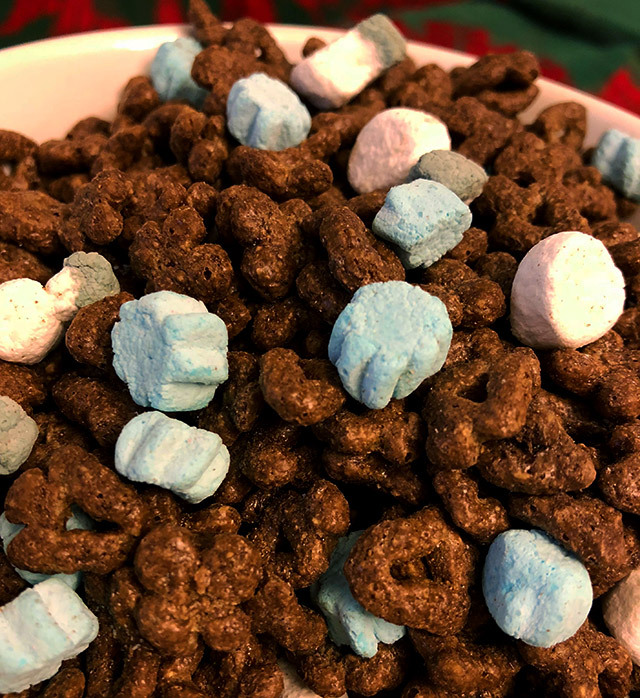 In fact, it’s more of a Frankenstein’s Monster made from several versions of Lucky Charms, stealing the chocolatey corn from one incarnation and the wintry marshmallows from another. Lucky is totally the type of leprechaun who’d turn a broken chair into an accent table. 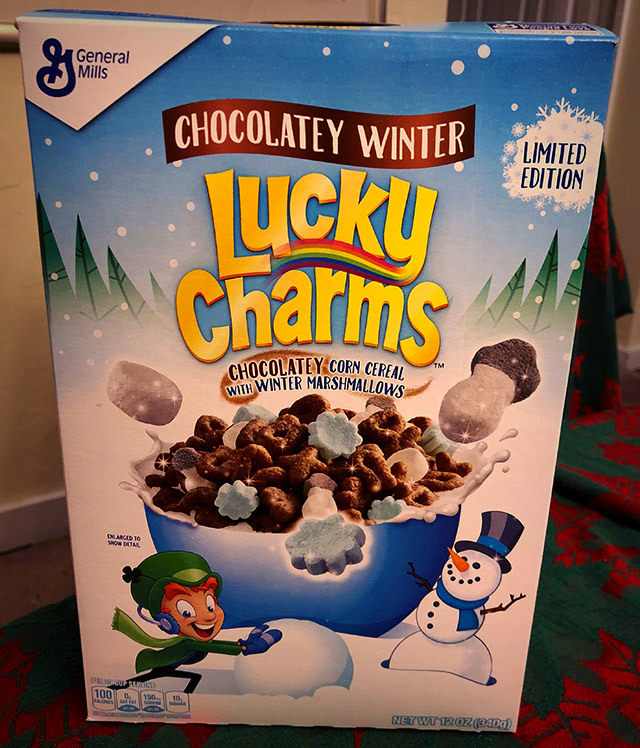 The flavor is admirably restrained for a limited edition holiday cereal. Too many of those rely on copious amounts of “flavor dust” to accomplish their goals, but this one is pleasant without being overpowering. Now picture me reading this paragraph aloud, with lots of gesturing. It’s even more annoying. My one criticism is about the box art. It’s too white and there isn’t nearly enough chaos. Maybe we’re supposed to use crayons to fill in the gaps? I’d give it a whirl, but I just know that trying to use crayons over laminated cardboard will make my head explode like I voted for Markos. 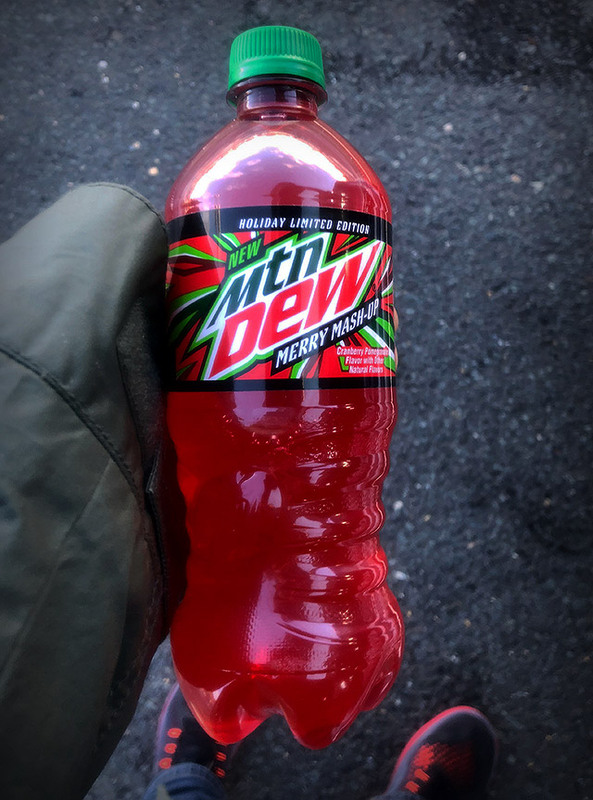 This could be considered a sequel to last year’s Mountain Dew Holiday Brew, and a big improvement on it to boot. 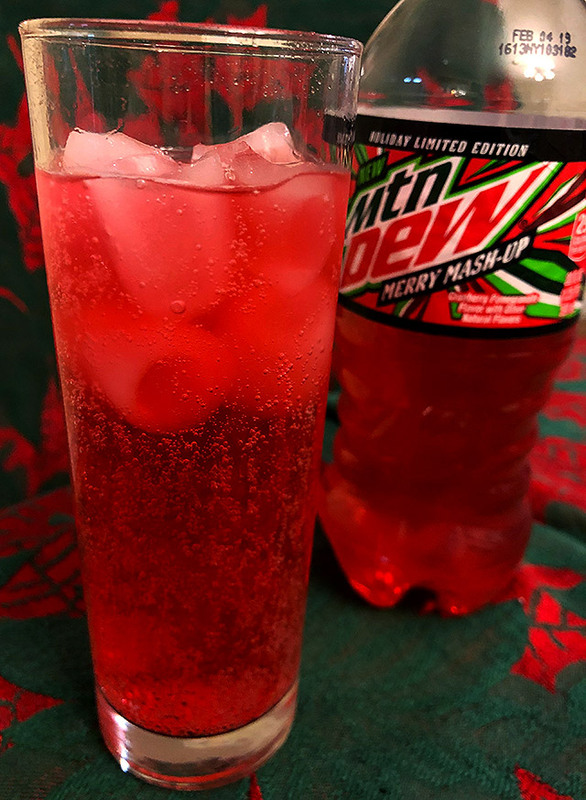 Holiday Brew was just a mix of existing Dew flavors, but this edition brings true wintertime flavors into the fold. A cranberry/pomegranate soda could not be more in my wheelhouse, and objectively, this one delivers. The flavor is more sweet than tart, but it’s still jusssst tart enough to make you feel like berries and arils are popping in your mouth. GRADE: B. It’s worth trying! 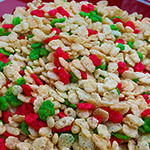 The assortment includes five holiday flavors: Pumpkin pie, eggnog, cranberry sauce, hot chocolate and candy cane. Those flavors are too conflicting to make the beans “good by the handful,” but that’s actually a plus. You kinda have to eat them one-by-one, so this tiny box of jelly beans can still kill ten minutes. The flavors aren’t muted or vague, either. They’re totally faithful recreations, warts and all. 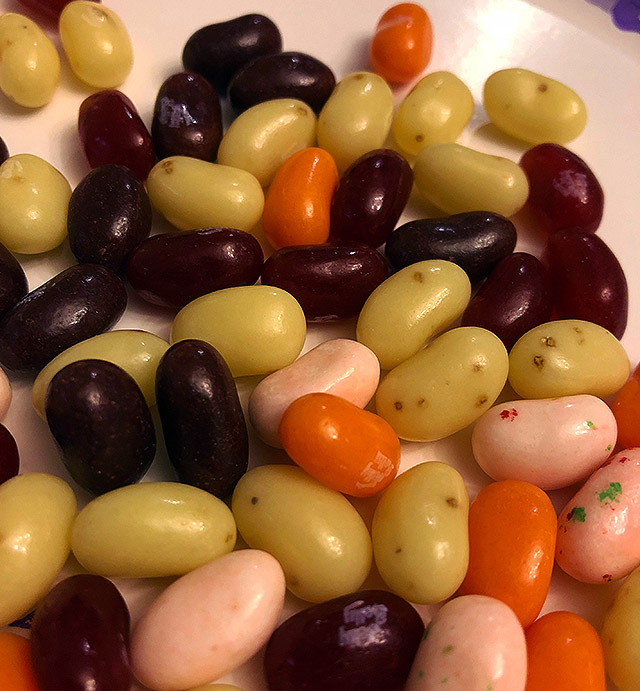 The cranberry sauce jelly beans taste so distinctly like cranberry sauce that you can easily picture astronauts eating them during Space Thanksgiving. GRADE: B+. The only flaw is that the mix doesn’t look very Christmassy. Halloween maybe and Easter definitely, but not Christmas. This needed a green jelly bean. 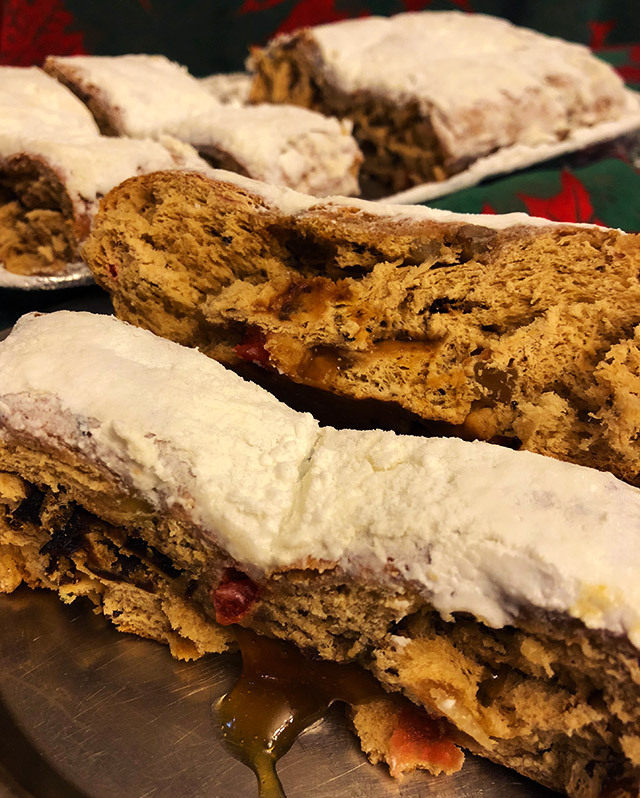 I know that Entenmann’s is a regional thing and out of reach for many of you, but this fruit stollen was just too beautiful to pass up. 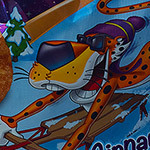 At least, the version pictured on the box was. 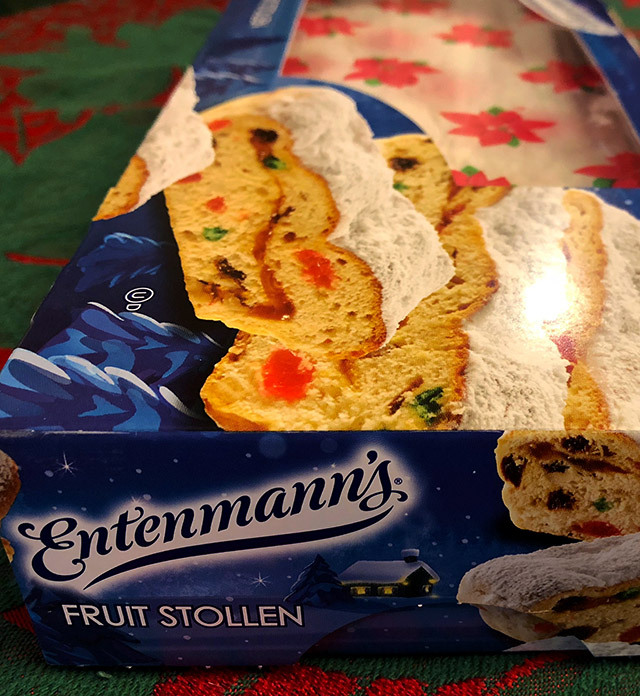 I considered the possibility that Entenmann’s simply misspelled “fruit stolen,” as my loaf was almost entirely devoid of green and red. What is this, Christmas barmbrack? Find a chunk of candied cherries and I’ll be married by New Year’s? Whatever. It’s still pretty. The powdered sugar looks so much like snow that I find myself rushing through this article so I can go make my G.I. Joe Arctic Trooper stomp over the leftovers. As for the flavor, it’s Grandma’s house stuffed into an International Coffees tin. GRADE: B+. It makes me want to invite friends over for slow-moving chats about rising bridge tolls. 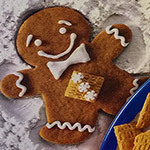 Thanks for reading about festive food.